At the start of your turn, give another random friendly creature +1/+1. Reachman Shaman is a common Neutral creature card. It is part of the Core Set. "We dance in the flames!" "Today, you meet your end." This card's ability applies the High Rock Blessing card effect. 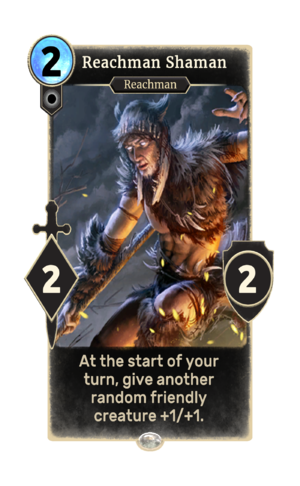 The card is named for the Reachmen, a Breton offshoot living in The Reach. This page was last modified on 15 February 2019, at 19:18.